Micromax has presented another phone in the Unite series, Unite A092, to compete in the same price range. The new quad core phone features interesting hardware with Snapdragon branded quad core and 1 GB RAM, which places it in the league of Moto E rivals that are popping up ever so often these days. Let’s compare this new member of Unite series with well acknowledged Unite 2 A106 (Quick Review) to know where they stand with respect to each other. Micromax Unite 2 features a 4.7 Inch display with same WVGA resolution (800 x 480) as on 4 inch display of Unite A092. Needless to say, your text and images will be sharper on Unite A092 (233 pixels per inches) as compared to Unite 2, but if more screen real estate ranks higher on your priority list, Micromax Unite 2 will be more palatable option. Micromax Unite 2 is powered by MT6582 chipset, the start quad core chipset from MediaTek clocked at at 1.2 GHz. If we compare the benchmarks of Micromax Elanza 2 with same chipset and Micromax Unite 2, Unite 2 with MT6582 is a better performer. The Imaging hardware used in both smartphones is same on paper and perhaps in reality as well. Both phones have a basic 5 MP shooter at the rear aided with LED flash for low light photography. At the front, a VGA camera is present for those interested in video calling and selfies. Micromax Unite A092 excels in this department with flying colors. It comes loaded with 8 GB internal storage breaking the trend of hackneyed 4 GB nand flash, which is also followed by Micromax Unite 2. The storage in both phones is expandable by another 32 GB. Battery capacity is 2000 mAh in Unite 2 and Micromax claims 7.5 hours of talk time. The battery lasts about one day with moderate use. Unite A092 on the other hand employs a mere 1500 mAh battery and with rated talk time of 5.5 hours. Operating system used in Unite 2 is latest Android 4.4 KitKat, where as Unite A092 is still stuck on Android 4.3 Jellybean out of the box. Both phones will give good android experience and considering the price bracket, OS won’t be a deal breaker. Micromax Unite 2 will however have an edge over Unite A092 as Android KitKat is better optimized for budget hardware. 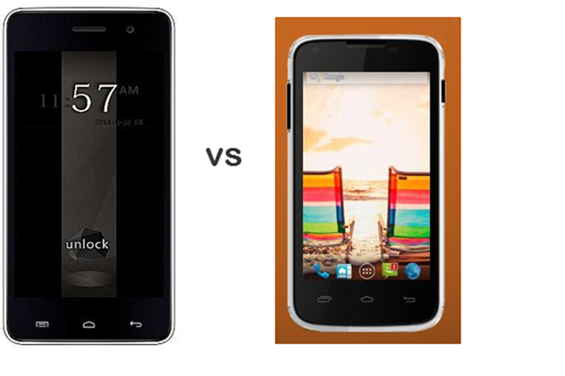 Both Micromax Unite 2 and Micromax Unite A092 represent the present wave of improvement in budget android segment. Unite A092 will provide you with better internal storage but will come with a smaller display on the other hand Unite 2 features latest operating system and better battery. Since the storage is expandable in both devices, Unite 2 seems slightly better option of the two but the final pricing will determine which one you should opt for.